One of the first couple things that Ryne Sandberg mentioned about the Phillies soon after taking over the team is about player's responsibility and obligation to the team. Obviously players that have been with the Phillies for the last few seasons know all about that. 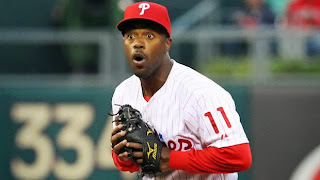 Shortstops rarely carry a team, and though Jimmy Rollins has at times set the pace for this team with his optimism and enthusiasm, the focus shouldn't be on turning on him and laying blame on Rollins for what has happened to this team. Yes, Rollins numbers are down, but he's also 34 years old and in the late innings of his career. Is he ready to retire? Probably not, but I think we've already seen the best years of Jimmy Rollins and to think that he is going to 'turn things around' and suddenly find the fountain of youth is very foolish and kind of strange. Ryne just has to look back at his own career to see where Jimmy is in relation to where Sandberg was at 34 years old. Sandberg played 14 total seasons in the majors (the same number of years Rollins is at now)- he retired in June of 1994 at 34 years old when he announced that "I am certainly not the type of person who can ask the Cubs organization and the Chicago Cubs fans to pay my salary when I am not happy with my mental approach and my performance," he stayed retired in 1995. He rejoined the Cubs in 1996 for the final two seasons in baseball for a grand total of 16 years as a Major Leaguer and was on his way to the Hall of Fame. Rollins defense was simply to say words to the effect of 'Look at what's going on here." In other words saying that the poor play that the Phillies have exhibited this season is contagious and it's a tough climate to try to and be great in. That's about what the Phillies looked like at certain times this season, that they had started getting comfortable in losing and playing poorly.